Dean and Jill Batie of Kearney are longtime Buffalo County 4-H volunteers at the fair and in preparing youths for non-fair competitions. Jill is office manager at Huss Livestock Market and Dean is a manager and appraiser with United Farm & Ranch Management. They are the recipients of the 2018 Freedom Award for agriculture. 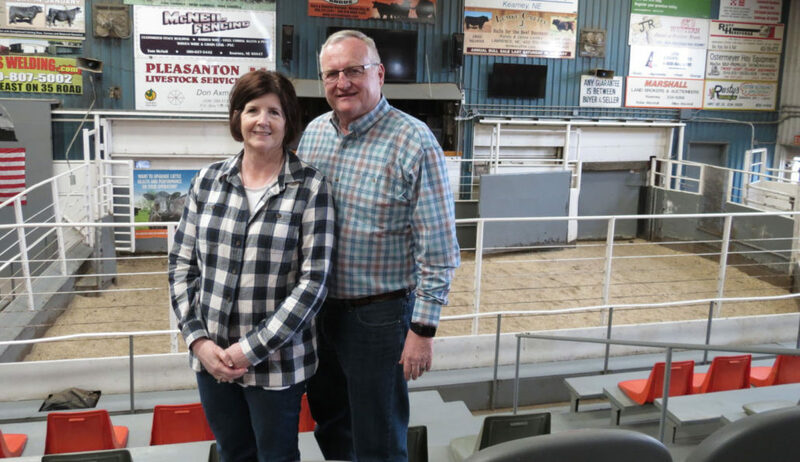 (Photo and article from the Kearney Hub) Dean and Jill Batie of Kearney, the 2018 Freedom Award winners for agriculture, have been involved in 4-H nearly all of their lives. As kids, Dean had 4-H beef, swine and sheep projects while Jill focused on sewing and other home economics projects. They helped lead the 1733 and Pleasant Hill 4-H clubs when their children, Ashley and Adam, were members. “She was probably more of the livestock wrangler with the kids than I was,” Dean said, nodding toward Jill. “(Adam) is already talking about (his daughter) Collyn being in 4-H, and she’s only 2,” Jill added with a smile. “Just the chores,” Dean added. “And how to roll with the circumstances, figure it out and have fun,” Jill said. As they wait for their grandchildren to be the family’s next generation of 4-H members, the Baties continue to support Buffalo County 4-H as volunteers. Jill, who is office manager at Huss Livestock Market in Kearney, is the clerk for the 4-H Livestock Auction at the Buffalo County Fair. “I helped (longtime clerk) Donna Marshall for a couple of years to get a feel for how she did things,” Jill said, noting that the experience involves more than working with numbers. Dean is a sheep show superintendent at the fair, but is most known as the longtime teacher-mentor-coach for Buffalo County’s highly successful meats evaluation, Livestock Skillathon and Livestock Quiz Bowl teams. He was the 1969 national reserve champion in 4-H livestock judging during his senior year at Lexington High School. The Dawson County 4-H team also was reserve champion that year. “Harold Stevens was kind of famous for that,” Dean said, referring to the former Dawson County Extension educator’s reputation for coaching highly competitive teams and recruiting 4-Hers to join them. Dean’s daughter was on Buffalo County’s national reserve champion skillathon team in 2000. Two other 4-H teams placed in the Top 10 recently, with skillathon sixth in 2017 and meats evaluation seventh in 2015. “Somebody is going to be champion one of these days,” Dean joked. The state event to qualify for national competitions in four events is PASE — Premier Animal Science Events — at the University of Nebraska-Lincoln in late June or early July. Dean coaches the skillathon, meats evaluation and quiz bowl teams, while livestock judging is coached this year by former Buffalo County 4-Her Alec Ibach. Dean said 4-H skillathon tests all-around knowledge of science and the livestock industry (cattle, hogs and sheep). The format involves problems that require 4-Hers to apply what they’ve learned to develop solutions. “You never know what the question might be,” Dean said. However, as a coach for 20 years, he’s seen many of the types of questions his 4-H teams might encounter. Much of the knowledge comes from skillathon practice sessions he has at his United Farm & Ranch Management office in northwest Kearney for members of the 4-H teams. Dean said quiz bowl also is a knowledge test, but involves a quick question-and-answer format. When asked why they have been Buffalo County 4-H volunteers for so many years, the Baties talked about giving back. “When we first started, we knew nothing about sheep and people helped us out,” Jill said. Dean thought about quitting coaching a few years ago, but then a new group of enthusiastic 4-H members showed an interest in the competitions. “The little kids are fun … You can see it on their faces when they get it,” he said. Ralston Ripp, a Kearney High senior, said she has traveled across the nation with Dean to represent Buffalo County and Nebraska in meats evaluation and skillathon contests. “He has brought in industry leaders to help with concepts he is unfamiliar with and has always shared in our excitement to learn new things,” Ripp said, adding that Jill helps by bringing supplies to the teams’ study sessions. George Janning, the 2017 Freedom Award recipient for agriculture, also nominated the Baties. The Baties said their overall goal at the county fair and other 4-H activities is to help make sure the youths have a good experience. “So they will come back,” Jill said.